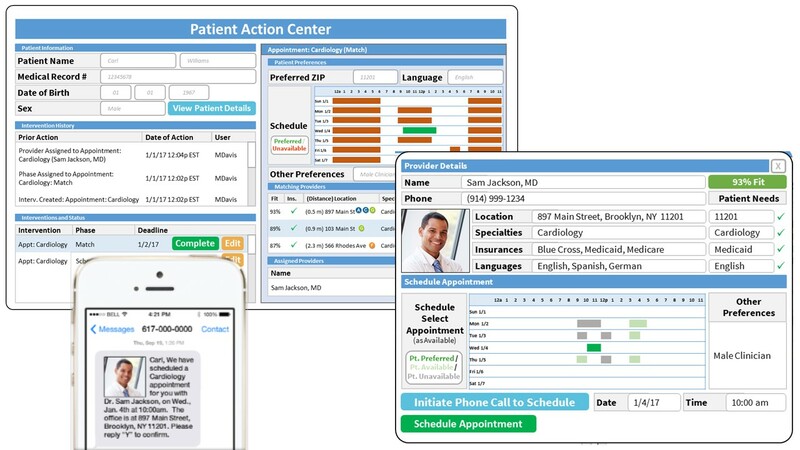 SmartConcierge optimizes care coordination and revenue by automating processes that that emergency department (ED) patient navigators use to increase follow-up adherence. Effective care coordination improves patient outcomes, professional satisfaction and the financial health of the healthcare systems. Unnecessary ED use is a sign of an inadequate patient-provider relationship and correlates with avoidable admissions. SmartConcierge helps health navigators match patients to the right providers based on office location, insurance accepted and schedule availability. After discharge, SmartConcierge automates reminders and monitors attendance. SmartConcierge leverages tools for patient engagement, utilization control, workflow automation and business by analytics to ensure optimal patient follow-up, which improves care quality, revenue, and patient loyalty. Our cloud host has strict privacy controls, utilizes a vetted reporting mechanism, undergoes stringent audits, and is responsive to concerns. Client information is segregated on a single-tenant server and protected with multiple-layer passwords and strict authentication processes. Data integrity is assured by 256-bit SSL encryption and server authentication with extended validation certificates. The system is functional across multiple platforms including tablets and smart phones. Clients have access to 24/7 technical support.